Today you will have time to explore the inner City of the new colourful containers now a vibrant shopping centre and just across to Quake City, a unique attraction aimed at informing, New Zealanders and international tourists about the Canterbury earthquakes. You can also take the local tram that takes you to various drop off points around the Christchurch Centre. If you have happened to have done some of this on Sunday afternoon there is always the chance of going to Akaroa a delightful French Village – this can be discussed. Your night’s accommodation will be in Christchurch. Today on your private tour you will enjoy a stunning scenic drive through the lakes of Tekapo and Pukaki stopping off various viewing points before making our way up to Mt Cook for your night’s accommodation. There is also the Sir Edmund Hilary centre one of the ambassadors and one of the world’s greatest explorers, the centre showcases the Aoraki Mount Cook Region, it’s people and its place in the universe. Your night’s accommodation will be at Mt Cook. With New Zealand I Drive private tours we will make our way through the blue lakes district and hydro villages of Otematata and Lake Waitaki and the Waitaki Valley to the East Coast of New Zealand stopping off at the Moeraki Boulders which are unusually large and spherical boulders lying along a stretch of Koekohe Beach. We will then make our way out to the Otago Peninsula a very special part of the South Island of New Zealand. Today you will join a guided tour through Larnach Castle a house built between 1871 and 1877 for William Larnach a famous Politician and Entrepreneaur of Colonial NZ. It has incredible views of the Otago Peninsula surrounded by beautiful Gardens. We will then make our way out to the Peninsula to have a look at the Albatross Colony Centre and the Tairua Heads and see if you can spot any seals. 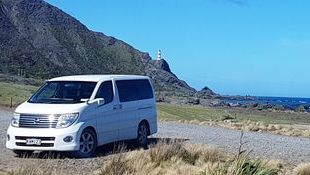 Today your chauffeur driven tour will make your way down through the Catlin Coast stopping off at various viewing points at Kaka and Nugget Points for stunning views of this rugged coastline. There are also opportunities to see seals and dolphins along the coastline. If time allows we will drive down to Bluff one of the oldest European settlements in New Zealand. It will then be onto Invercargill for your night’s accommodation. This morning you will have time to have a look around Invercargill before we make our way up to Te Anau to join a 2.30p.m. guided tour of this beautiful cave which is carved out by the force of the river that flows through them. The result is a twisting network of limestone passages filled with sculpted rock, whirlpools and a roaring underground waterfall. You will then be taken on a small boat to see a small grotto with thousands of glow worms unique to New Zealand. Your night’s accommodation will be in Te Anau. Your day begins in Manapouri with a cruise across the picturesque Lake Manapouri followed by a trip across New Zealand’s most expensive road over Wilmot Pass, pausing along the way to experience the dense Fiordland rain forest and view Doubtful Sound below. In Doubtful Sound you will board a purpose built catamaran for a 3 hour cruise. You will also have a chance to visit the Manapouri underground Power Station. I will pick you up after your cruise and we will make our way to Arrowtown for your night’s accommodation in Arrowtown . We will make our way on tour through the picturesque town of Wanaka and Haast Pass way up to Franz Fox Glacier and Franz Joseph. I will take you out to Lake Matheson, famous for its mirror-like reflections of Aoraki / Mount Cook and Mount Tasman/ Rarakiroa, New Zealand’s highest peaks, on a clear day. A delightful short bush walk will take you to a great viewing point. Your night’s accommodation will be in Franz Joseph. Today you will make your way to Hokitika the Greenstone capital of NZ, after enjoying a short walk up to a viewing point to Franz Joseph. You can then spend the remainder of the day having a look around some of the local art galleries with some unique art and craft made by locals. Your night’s accommodation will be Hokitika. We leave Hokitika today to make our way up through the beautiful West Coast to Punakaiki (Pancake Rocks) in the Paparoa National Park where you see stunning rock formations and lush rainforest and then it will be up to the Seal Colony at Cape Foulwind for some seal spotting. Later that day we will make our way through Murchison to your night’s accommodation on the edge of the Tasman National Park. This morning you will jump on board an Aqua Taxi that will take you up to the Awaroa Lodge set among a secluded part of the Tasman National Park. You will travel up through the spectacular coastline seeing a few of the most beautiful bays and beaches along the way. As you love seals Charles you will have time to visit a seal colony along the way and plenty of time to just sit and watch. You will then be taken to Awaroa where you can enjoy a short easy 20-30 minute walk to the Awaroa Lodge for lunch at 12.30p.m. You will then be picked up at 3.00p.m. for your return journey to Marahau. This morning I would suggest we make our way through Motueka and perhaps a couple of wine tastings on the way to Havelock and the Mussel Pot for lunch, the best mussels around. Afterwards I will take you to your vineyard accommodation in the heart of the Marlborough Sounds. This morning I would suggest some wineries before I take you to Picton for your afternoon sailing from Picton to Wellington. Here you can decide to stay for a couple of days at your own choice or fly out the next day. I can help out with this.